Photography by Phillip Sadewicz and narrative by Cody Laplante. Click on any image for a larger photo. 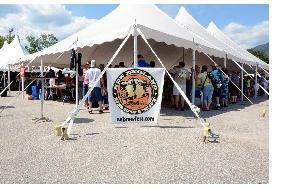 The 10th Annual New England Brewfest took place on the beautiful weekend of June 27-29th in and around Lincoln, New Hampshire. Between the 35 vendors, the hordes of volunteers, and the tasters, overall participation was estimated to be over 3,000-a record compared to the last decade. For its 10th anniversary, the brewfest went even bigger than ever-- lasting a whole weekend and including such new activities as a brewery tour, a beer-infused welcome dinner, and a full day of workshops and panel discussions by local brew masters. The centerpiece of the festival: Saturday evening's four hour unlimited beer sampling free-for-all. 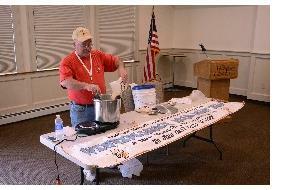 Steve Ainsworth, president of the Winnipesauke Area Brew Crew, in the process of steeping the wheat for a Bavarian wheat beer as he delivers the "Home Brewing: Beyond the Basics" lecture. Throughout the lecture, Steve explained his secret tips and tricks and shared which rules you can bend and which you can't to other enthusiasts. More involved guests and representatives stayed the weekend at The Loon Mountain Club hotel which also catered and hosted many of the weekend events. Guests were offered complete package deals for the weekend including lodging, all events, and VIP access to Saturday Night's ON TAP tasting event in order to get the shortest lines for the local brewers that they loved. 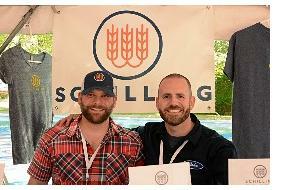 John and Jeff, co-founders of the Schilling Beer Co. serving up free samples of their antique recipes made with state-of-the-art technology. This company has been quickly gaining popularity since opening their restaurant, bars, and brewery in Littleton last September. 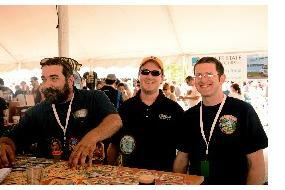 Their 'Kamarade' Baltic porter was voted among the attendees' favorite beers. The Flying Goose brewery in New London was the state's first solar powered brewery and it uses some of that energy to power its restaurant too. 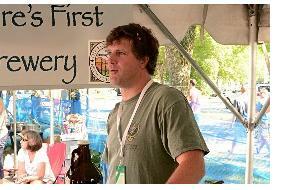 This brewery, like several others, made a beer exclusively for the festival. Unlike any others, Rick Marley's result was a stunningly sour red beer that had grape-like tones from having been aged in former pinot-noir barrels. Oatmeal Vanilla Stout, a spin on their normal oatmeal stout, was Woodstock's special offering for the festival, and it was amazingly popular with the festival-goers. 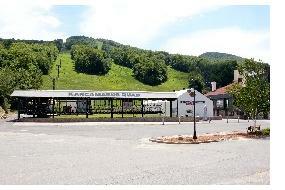 Woodstock station actually founded the New England Brewfest 10 years ago and hosted it in their parking lot. The company has played an integral part in the event every year.